Note: Version 1.0.1.1 (now with multi-store search) has been released. Please update by re-downloading below or go to Settings and Check for Updates. The Flight1.com Purchase Agent is Flight1's next-generation E-Commerce platform. This dynamic application is built with some of the best features of the classic Flight1 Wrapper in mind, with many new features to enjoy including multiple stores within the agent, easy management of all your orders, view videos in our Live Capture option, and more. You can manage all Flight1 purchases within a single application including viewing all your past Flight1 orders (many will be auto-converted to be in this system). The application contains different "Stores" within the Purchase Agent "Mall" which allow for customized presentations of different product lines by different vendors. Product downloads are handled within the system with all files stored to a configurable download location. Product updates can be distributed via the Purchase Agent. You can purchase more than one item at the same time (new to version 1.0.0.2 - You can also purchase from multiple stores at the same time). There is an Auto-Lookup option for product discounts if you are upgrading from an earlier version. No need to enter a coupon code in this case! Our Live Capture feed is a unique way to view captured video associated with a product. Forums and a ticket system are built into the system (configured at the vendor/product level). Communication to customers from publishers/developers is included so that you can get news, notifications, and product update information about your products. For developers: You can use the components of the system directly within your application, or create your own application to distribute your products. The Purchase Agent is a free download. Run the installer to install the application. We have tried to keep the size of the download to a minimum (the setup is < 2mb in size). A Flight1 Account will be required to purchase with the tool, however an account is not required in order to run the tool and check out the different stores. If you login to the Purchase Agent using the same email account that you used with the original wrapper purchase, your products will automatically show up in the Agent Library. If you do not have a Flight1 account, please create an account here and use the email address you originally used for your non-account purchases. Your orders will get automatically assigned to your account and then show in the Purchase Agent Library. Do contact Support if you need more assistance. What will happen to the Flight1 Wrapper? Flight1 will be gradually moving to the Purchase Agent platform. Some products may be in both the Purchase Agent and the wrapper, and others will be in one or the other. There are 100's of applications that are associated with our store, and migration will take time to implement. We are currently still supporting our classic wrapper for many products. As migration continues, some products will be moved exclusively to the Purchase Agent. How do I report issues with the Purchase Agent? 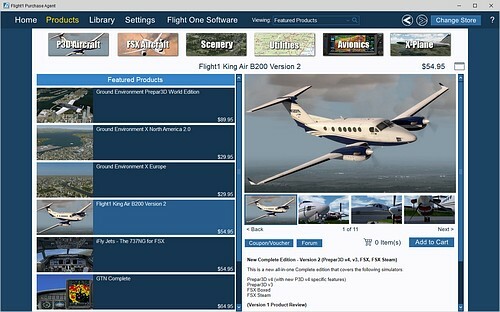 You can use the main forum from the home page of the Flight One Software store. You can also contact us via our regular Customer Service channels.